As the LA Marathon made its way toward the finish at the Santa Monica Pier last Sunday, runners and fans may have found it hard to miss the Pacific Park Ferris Wheel, which for one day only dawned an enormous circular advertisement for athletic shoe brand, Asics. "The Santa Monica Code Compliance department was planning to issue the notice, which serves as a written warning, to the amusement park operator on Tuesday for displaying unauthorized shoe advertisements, including a nine-story supergraphic on its Ferris wheel, City Manager Rod Gould said." Asics competitor, K-Swiss, was the presenting sponsor of this year's Los Angeles Marathon. The three year sponsorship running through 2012 also makes K-Swiss the event's official footwear and apparel sponsor. Asics, for its part, sponsors a number of other high profile running events throughout the year, including the ING New York City Marathon. 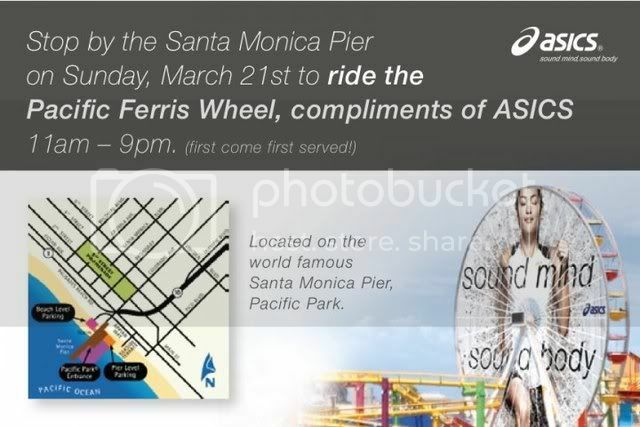 While Pacific Park officials say they were simply looking to use the ferris wheel sponsorship to offset financial losses resulting from the Marathon, a spokesman said the company will "work in good faith with the city of Santa Monica to resolve any signage compliance issues." Asics is not alone in its ambush marketing techniques. Ambush has been so effective for New Balance that the brand has opted to focus solely on marketing around, but not with events, after dropping its last official sponsorship, of the Chicago Marathon, in 2007. In fact, high profile running events provide the perfect platform for ambush marketers. Runners can use whatever product they choose, race fans/supporters are easily accessible to ambush and the 26.2 mile "field of play" is generally not governed by any physical barriers or constraints.